Pour olive oil in the pan. Add onion to the hot oil. After about 2 mins of cooking; add capsicum, green chillies and mushrooms to the onion. After 5 mins of cooking, add puree and canned tomatoes and break them roughly with ladle. Add garlic paste to the butter. Slice the loaf diagonally. Coat the butter-garlic mix on two sides of loaf. Heat the loaf on the pan till golden brown. I prefer to use elbow macaroni. 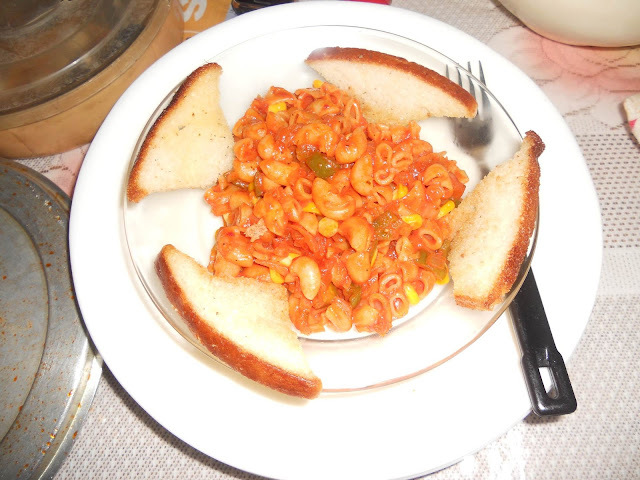 Though the recipe works equally well for all varieties be it penne, spaghetti, fusilli, fettuccini etc. No layered pasta though. Pasta takes approx. 15 mins on a boiling water to reach al-dente stage. You can judge when the pasta is done by taking out a piece and biting on it. If it feels firm and soft at the same time and doesn’t taste raw or floury when chewed, it is done. Add boiled pasta to the simmering mixture and let it cook for about five minutes. Place the pasta in the center of a bowl. Sprinkle oregano and place garlic bread on side. doesn’t get cooked too much. Pasta's have always been my fav... This is looking yumm. Good Going Aashish. FABOULOUS DISH. THANKS FOR THIS WONDERFUL POST. I HAVE BEEN TRYING PASTA MANY TIMES BUT COULD NOT GET THIS TYPE OF GOOD TASTE.